When artist Liat Berdugo moved to the Bay Area after finishing her MFA at Rhode Island School of Design, she sought out a community engaged in her interests: arts and technology. She tried Meetup gatherings, but, she found, "It was a lot of dudes talking about how many projectors they could get mapped onto one sculpture." Disappointed by the lack of critical discourse, in 2013 she co-founded Living Room Light Exchange (LRLE), a new media art salon, with fellow artist Elia Vargas. 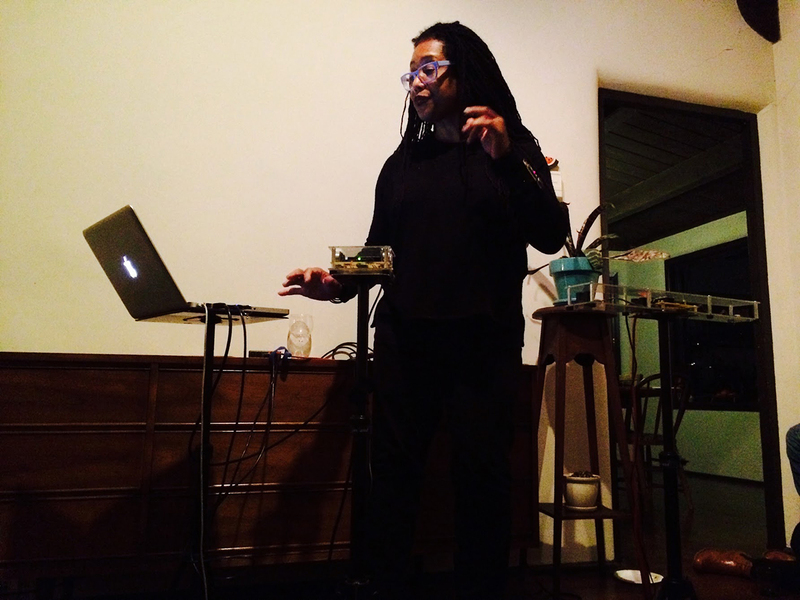 Since then, on the third Tuesday of every month, the duo host presentations and discussions of new media art in the living rooms of Bay Area residents, mainly in Oakland and San Francisco. Past speakers range from the interactive installation artist and Stanford professor Camille Utterback and Internet Archive founder and entrepreneur Brewster Kahle to Kathleen Quillian and Gilbert Guerrero, curators behind Shapeshifters Cinema, an expanded cinema series held monthly at the Temescal Art Center. The format of a LRLE doesn't vary: three speakers, each allotted 15 minutes, present on their work, with time reserved for questions and further conversation at the end at the night. Over the years, the event has grown its audience size and inspired offshoots in Tel Aviv, Paris, and New York. The answer might lie with Silicon Valley itself. “I think the Bay Area is so saturated in a representation of what technology is that people take the perspective that it’s a problem and react against it," Berdugo says. "You get entrenched in your communities here in a way you may not in a large city like New York.” By bringing together speakers working across disparate subject matter in the intimacy of strangers’ living spaces, she and Vargas foster thoughtful discussion at a distance from the tech industry. The next LRLE on Tuesday, Jan. 16, will see more cross-disciplinary dialogue with presentations from artist Indira Allegra, digital media historian Jacob Gaboury, and artist/designer Helen Shewolfe Tseng. LRLE’s devoted community also allows for serendipitous interactions among the speakers, attendees, and hosts. 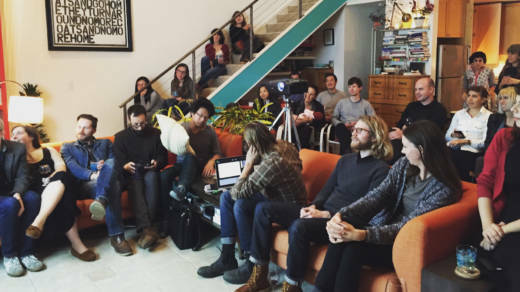 Last winter, at the loft of artist (and previous presenter) Kadet Kuhne, the host's friend Aaron Clayton-Dunn played piano between presentations from satellite imagery specialist Charlie Loyd, game scholar Soraya Murray, and artist Rachel Beth Egenhoefer. In LRLE's first season, Lily Alexander curated a selection of artists' work in her home. This month, host Yanika Schneider serves food from her own catering company, Periodic Table. Previous presenters and guests have struck up collaborations and curatorial projects, and more than a few professors have found just the right guest lecturer for their class. As the event grows in popularity, Berdugo and Vargas are more committed than ever to presenting work from thinkers, writers, and curators from a variety of backgrounds. "Our goal is to bolster work that people are making, especially toward intersectionality and diversity, so that our vision of what new media art is can be represented,” says Vargas. They’ve also made a point of paying their speakers as much as they are able. Gray Area Foundation for the Arts is the LRLE’s fiscal sponsor. 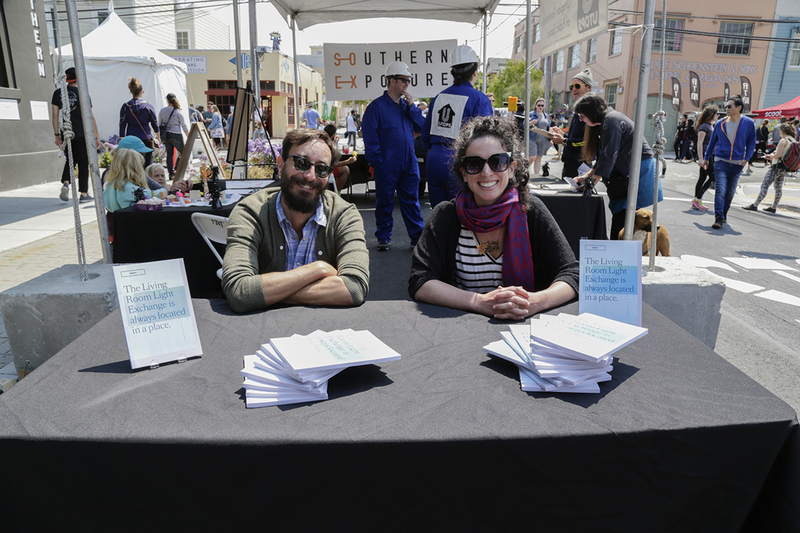 In seasons past, they received an Alternative Exposure grant from Southern Exposure and funds from The Clorox Family Foundation to put out two publications; we can expect a third in 2018. 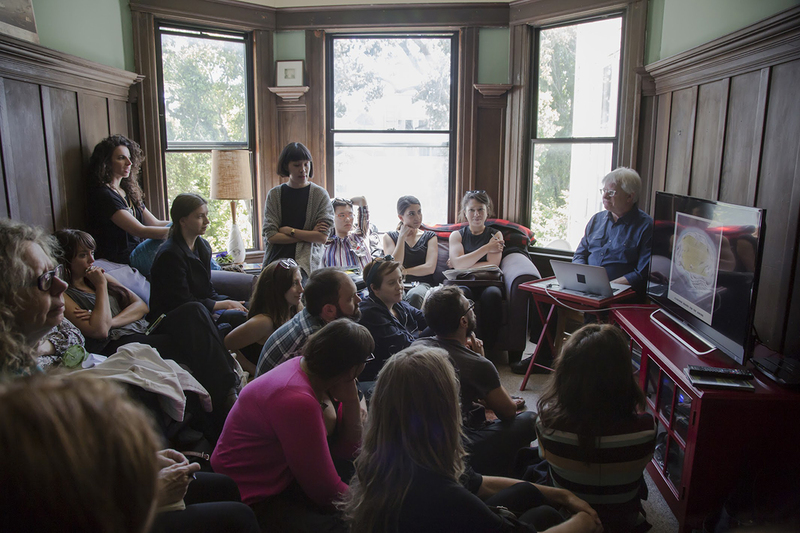 “We take very seriously that we’re culpable of [treating] artists’ labor as free labor. We’re trying to deal with this and hold ourselves accountable,” says Vargas. But questions of scale remain. In December, LRLE made their first year-end ask for donations, which they may consider doing again. In the meantime, they received a Zellerbach grant for $1000, which they plan to split among all 29 speakers from the September-through-May season, working out to a $32 per person. Acknowledging the token amount, Vargas adds "We thought we’d pay them in Bitcoin or Sacajawea coins as a playful recognition of these shortcomings.” Despite the struggle to pay people for their time, there's no denying the community formed during the four years of programming isn't going anywhere. The next Living Room Light Exchange takes place on Tuesday, Jan. 16 with presentations by artist Indira Allegra, digital media historian Jacob Gaboury, and artist/designer Helen Shewolfe Tseng. For more information, click here.